Made very welcome. Bed very comfy - always a bonus! Lovely location, 5 minute walk to nearest beach.The owners very friendly and helpful.Apartment was well equipped,and spotless ,had an excellent shower.Very good value for the price we paid. Very kind hosts, wonderful quality/price ratio. The place, like any other one outside Skiathos town, has to be reached by car or scooter or bus. A lot of restaurant and beaches within walking distance, anyway. Reccomended! Like many others have said, the hosts really make you feel welcome. They are so friendly and happy and nothing is too much. The rooms were very clean and the wifi is very strong in all areas and very fast. As a family we felt safe here and also felt liked valued guests. 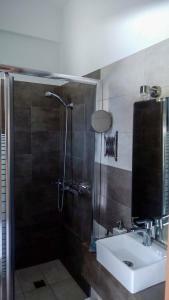 Lovely room with good AC and powerful shower. Quiet location, nice garden. Very friendly owners. Handy for the beach. 5 mins from resort centre. Friendly bar next door. Cash machine approx 50 metres away. Perfect location ,near the beaches . Very clean and tidy rooms . Very helpful owners nothing is too much trouble Would definitely recommend it !!!! Lock in a great price for Villa Karina – rated 9.1 by recent guests! One of our top picks in Kolios.The family-run Villa Karina is surrounded by lush greenery within 650 feet from the beaches of Agia Paraskevi and Kolios. It offers self-catered accommodations with free Wi-Fi and balcony or terrace overlooking the garden or the Aegean Sea. A kitchenette with cooking facilities and fridge is included in all units at the Villa Karina. Each comes with a satellite TV and air conditioning. Guests can relax in the garden that features a sun terrace and BBQ facilities. Taverns and restaurants are within a 5-minute walk. The multilingual staff can offer information on attractions such as Skiathos Town within a 5-minute drive. Skiathos International Airport is 4.3 mi away. 뀐 Located in the top-rated area in Kolios, this property has an excellent location score of 8.7! When would you like to stay at Villa Karina? Air-conditioned studio with free WiFi and balcony overlooking the Aegean Sea. A kitchenette with cooking facilities and fridge is included. This studio features a stovetop, kitchenware and satellite TV. This apartment has a kitchenware, flat-screen TV and air conditioning. House Rules Villa Karina takes special requests – add in the next step! Villa Karina accepts these cards and reserves the right to temporarily hold an amount prior to arrival. Guests need be quiet between 12:00 PM and 6:00 PM. Please inform Villa Karina of your expected arrival time in advance. You can use the Special Requests box when booking, or contact the property directly using the contact details in your confirmation. We were just disappointed by bathroom dimensions... Large room, small sink... Nice shower, anyway. Beside that, large and comfy bed. Care required walking along the road. No pavement but that is the case for the whole area. The room was large and very clean also the king size bed was actually king size and very comfortable. The hosts were so lovely and friendly upon arrival and check out.